The Union cabinet approved a ₹13,366-crore Metro rail project for Patna, expected to be completed in five years with two rail corridors. 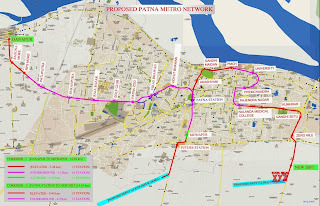 The Danapur Cantt-Mithapur corridor will pass through the heart of Patna and connect densely populated areas like Raza Bazar, Secretariat, high court and Law University Railway Station. The Patna Junction-ISBT corridor will connect Gandhi Maidan, PMCH, Patna University, Rajendra Nagar, Mahatma Gandhi Setu, Transport Nagar and ISBT. The corridors will have multimodal integration with railway stations and the ISBT station and will have a feeder network of bus, intermediate public transport and nonmotorized transport. “The existing population of 26.23 lakh of Patna agglomeration area is expected to be benefitted by Patna Metro rail project directly and indirectly,” finance minister Piyush Goyal said after a meeting of the cabinet chaired by Prime Minister Narendra Modi. “The residential areas along this Metro rail corridor shall be immensely benefitted by this project, as the people of these areas will be able to travel on trains from their own neighbourhoods to reach different areas of the city conveniently,” he said.